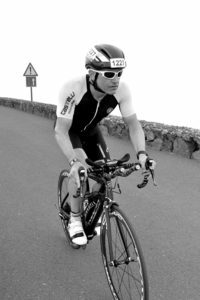 Lanzarote one of the toughest Ironman races in the world, hot, windy, hills so why not! I have to say the place lived up to its name a truly brutal course. I had decided xmas 2013 to get myself back in shape after almost 5 years of doing pretty much nothing as far as training goes. I had convincing myself 3 times to the gym a week whilst eating the house out was an ok way to maintain health and fitness. Sometimes we all get caught up in work and chasing material goals whilst forgetting the importance of our own personal wellbeing. Well after only 4 months training I roped in a mate to doing what was then Challenge Vichy (Ironman distance tri), which after only a few months training was as hard as you would imagine it would be. However, it gave me the appetite to get back into the endurance game, loose some lard and set some goals. One of those was to do Ironman Lanzarote in May 2014. I always new I would be rubbish at climbing as I am just not built for the mountains (or for that matter the heat!) but the event was close to the UK and I love a challenge. It was also a good excuse to help me get back in shape so I signed up. I stayed away from the main part of Lanzarote and we (Wife, Daughter, Mam) hired a villa about 45 mins drive from Puerto Del Carmen, and hired a car. I never really liked the atmosphere of Ironman’s as everyone looks each up and down, checking out bodyfat percentages, bikes etc. Staying away from the main event at least until the day before is good idea as you can keep relaxed without all the pre-event triathlon talk and bragging that comes with it. For me these Ironmans have to be a a family holiday rather than just dragging the family around. They need some recognition for the time we as Ironman spend away from them training and who picks up the slack when your out on that long run or long bike. Its only fare to give them as much of a holiday as possible. It was not super hot over the week pre-event but it was windy when out on the bike course route. Being from the North East of the UK the wind is a daily occurrence in training and you just come to accept. I also chose to ride Lanzarote on a road bike with some clip on tri-bars to better deal with the hills and the wind. SWIM (66 Minutes): Was another early start pre 5am and was fully packed the day before (of course a re-check and then another recheck the night before). Been a while since any ocean swims but the forecast was not to be too windy so I had high hopes that if I made it through the swim I could get round the bike course without been blown down a volcano. The swim was a simple 2-lap circuit with a short beach run between the laps. I positioned myself just behind the hour swimmers and to the left. 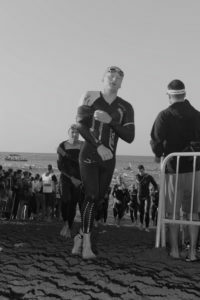 The swim was ok and didn’t to bashed about and fell out of the water in 66 min – next stop was the bike. BIKE (7Hours 6mins): Got to say was worried the bike but made the decision to play it conservative and hold the bike at 170w with 220-230w on the hardest climbs where possible. Most of the course is not super difficult if well paced but there are a few real tough sections and these are Mirador del Haria and Mirador del Rio. Haria has a real tough section before the special needs station and the top of the climb on entrance to the climb there where quite a few wheel suckers (drafters) working together that resulted in some amusement and choice language from a number of Brits out on the course. Whilst on the climbs there where quite a few walking especially just before the last turn before the summit. Keeping the watts low at the peak of the big climbs was almost impossible and is a case of damage limitation and keeping relaxed. The worse part of the course was rough Nazaret road climbing back to Teguise. The road surface (if you can cal it that) was hideous and I was gland not to be on TT bike as it would have been a real boneshaker. I was lucky to escape without any punctures and the last 15k is pretty easy back to town and its here you can start to take stock if you have gone to hard and what’s left in the legs for the run. At this point the sun was up and despite the sun block my forearms where starting to fry. RUN (4hours 29mins): I love to run and had already completed the Barcelona marathon a few months earlier in 3hr 4mins, but the heat has always been my foe as a heavy sweater. And given the zero shade of running the 3-lap sea front of in Lanzarote I knew I was in for a tough time. At least I knew I would finish the course becoming an ‘Ironman’ for the 1st time. Sure enough the run was tough with the temp in the mid 30s and especially when you can see the holiday-makers sucking down ice cold beers and ice creams. Despite the long walks I eventually finished and crossed over the finish line with my daughter to claim my medal, t-shirt and the bragging rights to finishing one of the toughest 1 day events to become an Ironman.